1) dhtmlxSuite updated 5 times! These updates brought us three new components – Sidebar, Carousel and List. Besides, lots of new features were added and many improvements were made. 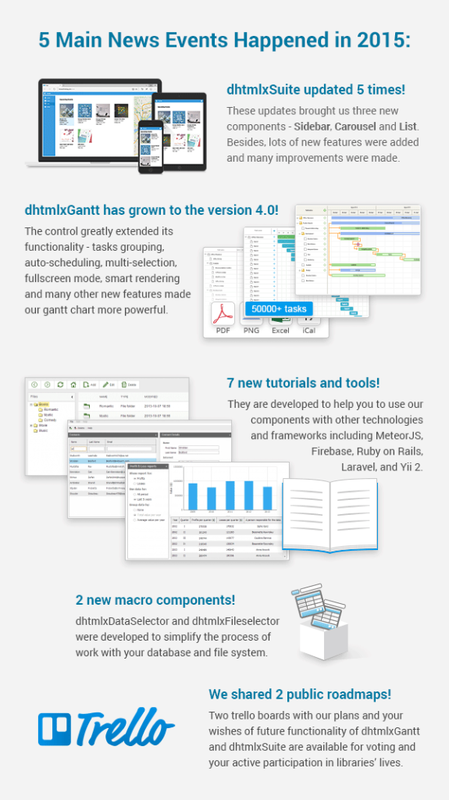 2) dhtmlxGantt has grown to the version 4.0! The control greatly extended its functionality – tasks grouping, auto-scheduling, multi-selection, fullscreen mode, smart rendering and many other new features made our gantt chart more powerful. 3) 7 new tutorials and tools! They are developed to help you to use our components with other technologies and frameworks including MeteorJS, Firebase, Ruby on Rails, Laravel, and Yii 2. 4) 2 new macro components! dhtmlxDataSelector and dhtmlxFileSelector were developed to simplify the process of work with your database and file system. 5) We shared 2 public roadmaps! Two trello boards with our plans and your wishes of future functionality of dhtmlxGantt and dhtmlxSuite are available for voting and your active participation in libraries’ lives.